You will always be guided by an experienced, well-trained guide. You can ride 20 km per hour with a Segway. 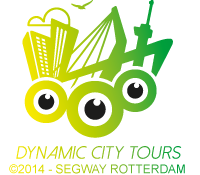 The Segways of Segway Rotterdam have been limited and won’t exceed 20 km per hour. Make sure you wear good shoes. No heels, no flip-flops. Maximum speed is 25 km/hour. Segways can reach a speed of maximum 20 km/hour. A Segway must be insured in accordance with the Motor Insurance Liability Act. All Segways of Segway Rotterdam are insured (third-part insurance). In the dark, at dusk and by day in case of poor visibility both headlight and taillight must be on. Your Segway must have reflectors as well. All Segways of Segway Rotterdam have proper lighting. Participation in the Segway activities is permitted for persons of 16 years of age and older with a minimum weight of 45 kg and a maximum weight of 150 kg. Everyone must wear a helmet when riding a Segway of Segway Rotterdam.